Starring the voices of Cathal J. Dodd, Cedric Smith, Norm Spencer, George Buza, Lenore Zann, Catherine Disher, Alyson Court, Chris Potter, Alison Sealy-Smith. For much of my childhood, I preferred Marvel superheroes to DC, both because Marvel seemed to have more fleshed-out characters in real-world locales and because Marvel’s cartoons were better animated. 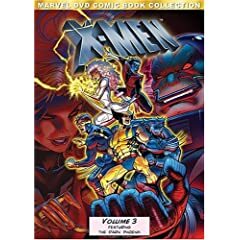 Warner Bros. Animation’s recent DC Comics projects have done much to sway me, so it’s a pleasure to look back on the X-Men cartoon that aired on Fox from 1992-95. To me, this remains Marvel’s best-looking, smoothest-animated project. 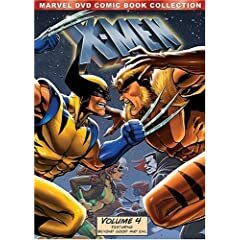 Combine the animation, ambitious ripped-from-the-comic-book storylines, and Cathal J. Dodd’s much-echoed performance as Wolverine, and you have a classic. My only complaint about X-Men when it aired was the stories were too complex to follow week-to-week. DVD solves that problem, of course. These volumes are presented in the original fullscreen with no special features, but it’s enough to be able to play the stories out in one sitting.